The way we communicate online is constantly changing. In today’s on-demand world, users have come to expect a more personal experience; One that can’t be provided using forms and traditional follow-up, days later. Finally, a strategy that gives customers the personalized value they are looking for, and allows businesses to scale while saving time and resources. So you may be wondering what exactly is conversational marketing. Here’s your answer: Conversational marketing is the use of live chat, chatbots, and social monitoring to foster genuine conversations and real relationships. As my teammate, Kyle Bento, would say, it is the return to businesses communicating organically. The goal of conversational marketing should always revolve around enhancing your user’s experience, while minimizing friction. In this article, we are going to explore some examples of conversational marketing that have proven this is not just a trend to be overlooked. HealthTap is a company designed around the idea of making healthcare more accessible. 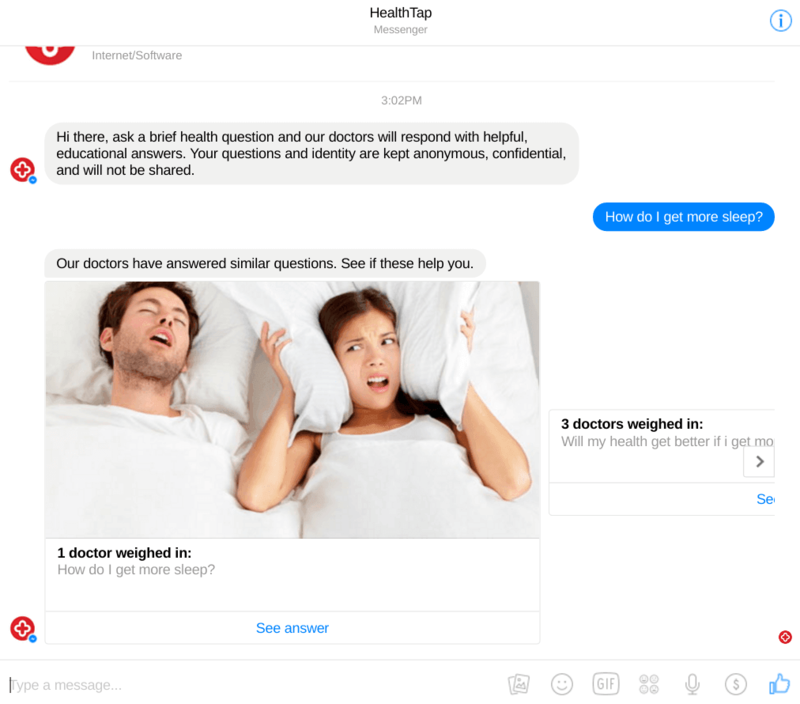 In order to do so, they’ve taken steps to take their services directly to the user by creating a HealthTap chatbot on Facebook Messenger. Once you’ve installed the bot, HealthTap prompts you to ask any health-related question. Once you ask, the bot analyzes your request and shows you popular answers to similar questions. By clicking ‘See answer’ you can even see how many doctors have offered answers to each question, and check out their responses in more detail. If the answer isn’t quite what you were looking for, you can have your question sent out and answered by a real doctor, with most questions being answered in a day. And, if you don’t want to wait the ~24 hours, the ‘Get answers now’ button will bring users to HealthTap’s premium health consulting service, where you can get in touch with a doctor within minutes for $25. Talk about convenient. This chatbot does a great job demonstrating how its possible for companies to provide answers to their customers questions in real time, at scale, and for low cost, even providing a great opportunity for upsell once you’ve shown your value. Health is a personal topic and, for many, one-on-one communication with a doctor or healthcare professional is extremely important. With busy schedules and high demand, however, sometimes it’s difficult to get this personal attention. That’s why HealthTap’s app is such application of conversational marketing. If it wasn’t for the obvious links, one might think they are actually getting the answers from a real doctor, in real time. The back and forth makes the interaction feel similar to a real conversation, and when you add in the ability of the bot to actually connect you to a real doctor if need be you have the perfect storm for excellent conversational marketing. RapidMiner is a great example of how to successfully use a chatbot to scale conversations, and cut out noise to find the best leads. 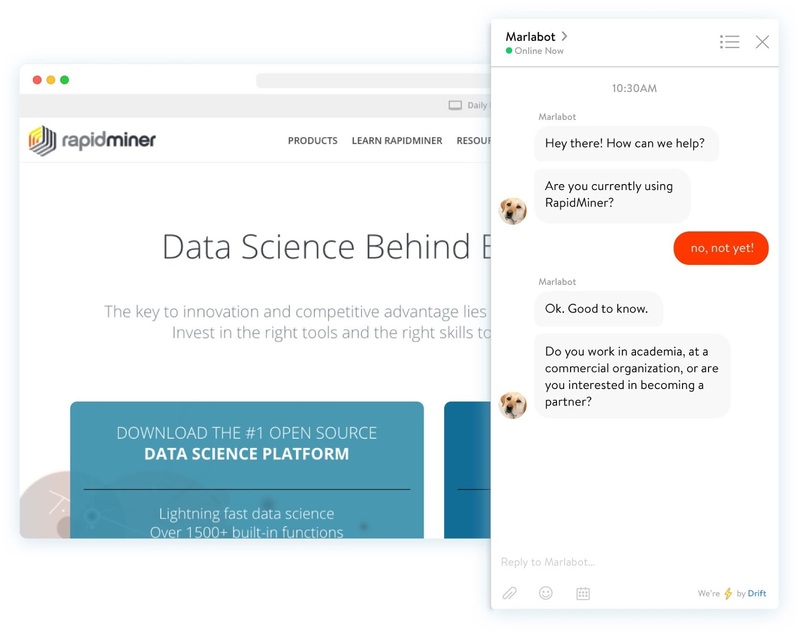 RapidMiner took the bold leap, doing away with their traditional lead capture forms, using a chatbot from Drift. With so many visitors coming to their site, it was clear they couldn’t afford to talk to everyone, and shouldn’t try to. Their time was best spent focusing on the conversations with the people who were most likely to buy. RapidMiner was able to find those people through their intelligent LeadBot, which allowed them to automate the lead qualification process by asking the same qualifying questions your sales team would ask. Qualified leads were then automatically asked to schedule a meeting with a sales rep, taking a huge load off their shoulders of having to personally qualify leads. By adding this more personal, conversational experience to their site, RapidMiner was able to engage and evaluate nearly every visitor to their site. The switch to conversational marketing via the intelligent LeadBot has since captured 4,000 leads, and added $1M into their sales pipeline and most importantly, it allowed them to help everyone, even those who may not be looking to purchase. Isn’t this the goal of conversational marketing after all? A personal shopper on-demand? This may be every girl’s dream, and Spring made it happen. 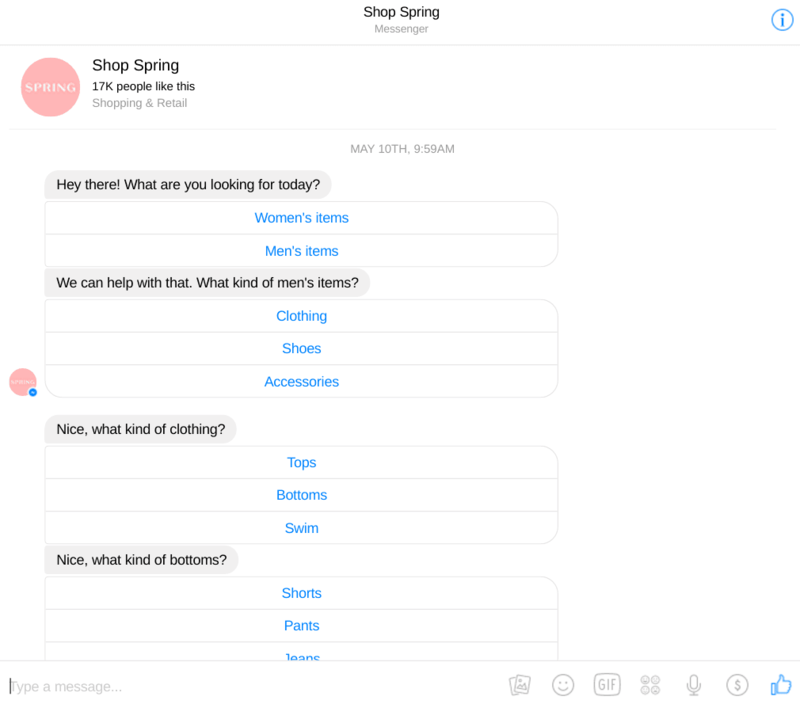 Spring’s personalized shopper bot isn’t that type that will have a conversation, but trust me, it doesn’t need to. Every interaction with the bot begins with a list of questions designed to narrow down exactly what you are interested in. Once you’ve narrowed it down to the type of product you’re looking for, you define your price range and, just like that, Spring provides you with multiple product recommendations from different brands across the web. By using a bot to help you shop, Spring is able to get you to the products you actually want, quicker. Lots of eCommerce sites have a massive catalog of products that can leave users searching for hours, but this brought brings conversation and personalization back into the experience. It cuts out search time and creates the illusion of one-on-one attention that is usually lost in online shopping. 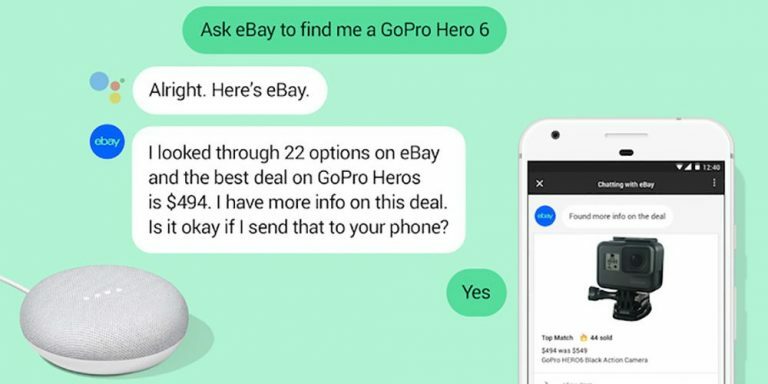 eBay has created one of the most advanced eCommerce chatbots there is, which also happens to be the most popular. This chatbot is unique to our list because it is built for Google Assistant, meaning you can only access it with your Google Home, or your Android phone via voice. Much like Spring, this bot allows you to navigate across a very high number of product categories, but this time, only by voice. Just say, “Ok Google, let me talk with eBay” and bam, your on your way to endless eBay purchases. The bot quickly finds you the best deal for what you ask for and will send the information to your phone for easy purchasing. This is a perfect example of how to integrate conversational marketing with voice search. The ease of the verbal conversation makes it seem like there may be a real person on the other end getting you what you need. With the rising popularity of voice-activated tools like the Amazon Alexa, Siri, etc there is no question that we will be seeing more voice-based conversational marketing in the future. 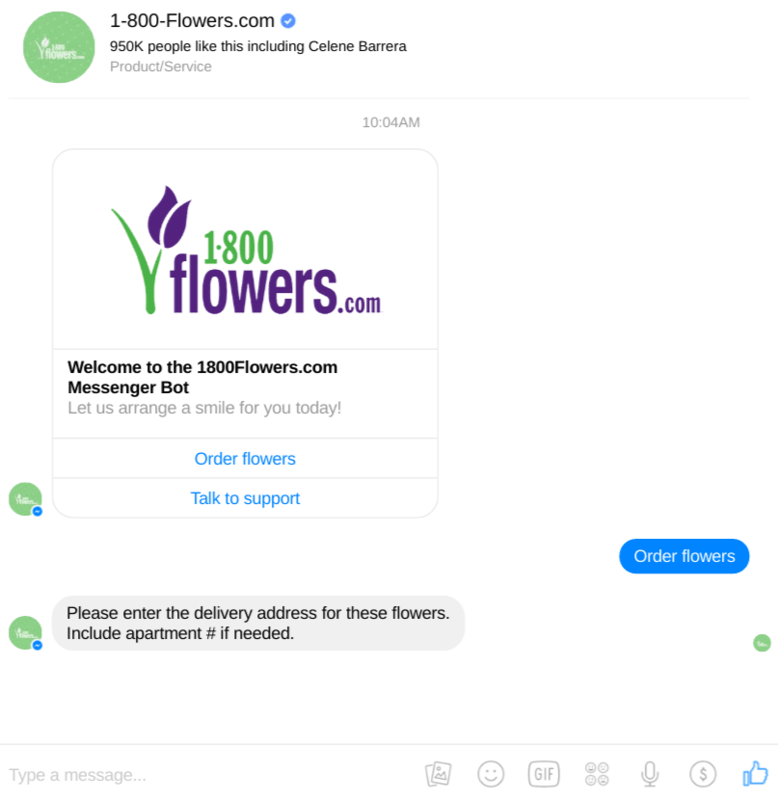 1-800-Flowers created one of the first chatbots on Facebook Messenger. It is super simple, yet beautifully efficient. Once you click ‘Get Started’ in Messenger, the bot responds with two options: Order Flowers and Talk To Support. From there, you can complete your entire flower order without leaving the window. This bot is even great at parsing addresses correctly. Once you’ve given your address, you are shown a variety of flower arrangements that you can click through. With the simplicity of this bot, you never second guess the smooth execution happening on the backend. It makes ordering easy, but more importantly fast. This is crucial for bots on Facebook, as there is always a million distractions waiting to catch the users attention. By embracing the change that is conversational marketing early on, 1-800-Flowers was able to expand their reach immensely, reporting that 70% of the orders received via their chatbot are from new customers. This proves that users are feeling increasingly comfortable conversing with a bot. The ease and efficiency of the process gives the customer the feeling that they are working with an actual customer services rep, instead of having to click through a dozen web pages to get the job done. Ride-sharing apps are a great example of how of old services and new technology can work together. Users take to a technology to request a ride, then meet up with a person who can fulfill it. However, through its chatbot available on Messenger, Slack, and the Amazon Echo using a simple voice command, Lyft has brought a more human experience back to even the ride request. Lyft’s integration with Messenger makes it super easy for people to request rides while on the go. All you have to do is click the car icon and you’ll instantly be matched with local drivers. The friendly Lyft Facebook Messenger bot lets you know when your driver is on the way, shows a picture of their license plate number, and tells you what car they’ll be driving. On Slack, passengers can request rides and trip-related information by typing in slash commands. Simply type /lyft in any channel to receive a list of Lyft related keywords to use. You can determine ETAs, available vehicle types, and fare costs all from the convenience of the Slack app. Through these new engagements, Lyft is striving to make customers lives easier by shortening the steps and simplifying the process for getting a ride. By adding these conversational elements they are saving customers time and effort, and in turn enhancing their experience. It may seem like a large feat to change your sales and marketing methodology to incorporate conversational, but it’s easier than you think -- And, it doesn’t all have to happen at once! With tools like Drift and the new HubSpot Conversations, businesses are able to field hundreds of conversations a month that wouldn’t have even happened before.